Posted on February 22, 2016 at 2:57 pm. Guts Casino are constantly adding new additions to their pokies catalogue and in the past few weeks there have been quite a few worth our money. The most recent addition to Guts online casino catalogue, Genie’s Touch by QuickSpin, was added just last week, after it was announced at the ICE Totally Gaming Conference 2016. Featuring 10 paylines over 5 reels, players are treated to the Genie’s Touch Feature where adjacent symbols transform into matching symbols for big wins. There’s also 10 Free Spins which feature additional magic lamps – these trigger the Genie’s Touch feature. 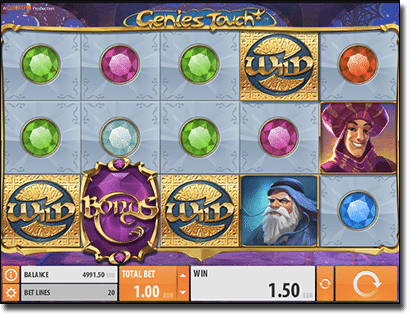 Genie’s Touch is available on desktop and mobile devices now. NetEnt’s latest addition includes a fantasy themed pokie based on a realm of magic including escape artists and illusionists. Players are treated to 243 ways to win offering Substituting Wilds where the Wild, which appears on reels 2, 3, 4, and 5, substitutes for other symbols to create the biggest payout possible. There’s also the Linked Reels feature, where at least two adjacent reels link up and transform into all the same symbols. You can get up to 5 linked reels too. 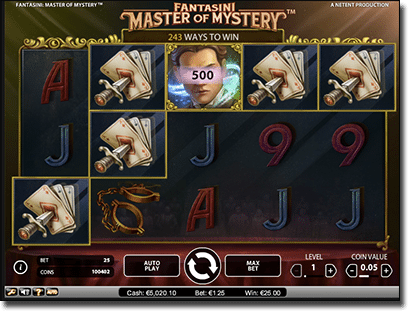 You can play Fantasini: Master of Mystery on smartphones, tablets, laptops, or desktops. Genesis Gaming announced the release of this pokie at the end of January, rolling it out at Guts online casino at the start of February via the Quickfire platform. The 5 reel and 25 payline pokie is based on the Lewis Carroll’s novel ‘Through the looking Glass’, and features Wilds, Scatter Pays, and a Clash of Queens Battle Feature where you can win free spins or a pick me bonus. When a Red Queen appears on the first reel and a White Queen appears on the fifth reel the Battle feature is activated. Players pick who will win, which ultimately picks whether you’d prefer a Free Spins feature or a Pick Me style Bonus. Players can win eight free spins, which can be re-triggered, in the Red Queen Free Spins, or a bonus in the White Queen Pick Me Bonus Game. 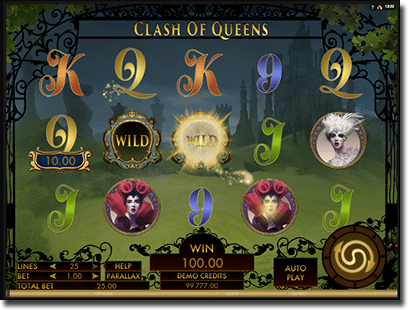 Players can spin the reels of Clash of Queens on their Apple, Android, Windows, or other mobile device, or on their laptops or desktops. Microgaming rolled out one of their February releases to Guts online casino at the start of February and as such players can head to the beach with five bikini-clad girls and win. With 243 ways to win over 5 reels, players can win up to 15 initial free spins, with 15 additional free games available to re-trigger, all with a 3x multiplier applied. However, what sets this pokie apart is the unique Reel Re-Spin Bonus where players can pay extra to spin a reel, after completing their first spin, for another chance of completing a winning payline. There are up to 60,000 coins available to be won and players can spin the reels on their mobile or desktop device. Sign up now to www.Guts.com via our links and make a deposit to try out the following new titles with real cash, including free spins and a new no-deposit bonus.